This film is not fiction or a mockudrama but a new investigative documentary from the internationally acclaimed team at SkyWatch TV. 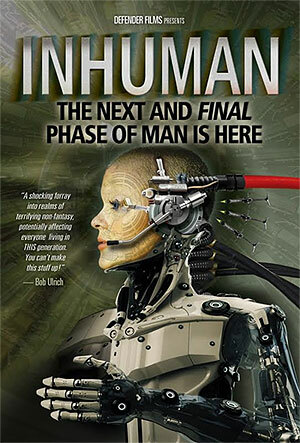 INHUMAN travels the globe to unveil for the first time how breakthrough advances in science, technology, and philosophy - including cybernetics, bioengineering, nanotechnology,machine intelligence, and synthetic biology - are poised to create mind- boggling game-changes to everything we have known until now about Homosapiens. As astonishing technological developments push the frontiers of humanity towards far-reaching morphological transformation (which promises in the very near future to redefine what it means to be human), an intellectual and fast-growing cultural movement known as transhumanism intends the use of these powerful new fields of science and technology as tools that will radically redesign our minds, our memories, our physiology, our offspring, and even perhaps-as Professor Joel Garreau, Lincoln Professor of Law, claims- our immortal souls. The technological, cultural, and metaphysical shift now underway unapologetically forecasts a new future dominated by a new species of unrecognizably superior humans, and applications under study now to make this dream a reality are being funded by thousands of government and private research facilities around the world. As viewers will learn, this includes rewriting human genetics, combining human and animal DNA, and interfacing our brains with strong artificial intelligence systems. As a result, new modes of perception between things visible and invisible are expected to challenge bioethics in ways that are historically, sociologically and theologically unprecedented. Without comprehending what is quickly approaching in related disciplines of research and development, vast numbers of indiviuals could soon be paralyzed by the most fantastic - and widespread - implications. The destiny of each individual - as well as the future of their families - depends on their knowledge of this new paradigm, an extraordinary time in the earth's history already being called the "Hybrid Age". As Jesus promised, 'When ye see these things come to pass, look up, for your Redemption draweth nigh'!